Hooray for a quiet weekend at home. We don’t get too many of these, so I’m planning on taking advantage of it! Only a few more weekends left until school starts back up. Do you have big plans this weekend? 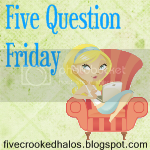 For now… let’s do a little Five Question Friday fun! Be sure and share your answers in the comments below! What is one thing you have too many of in your house? Too many toys! Oh my goodness, the girls play area is just overflowing with toys. Most of them are broken, old or just don’t even get played with anymore. I need to do a toy cleanout sometime soon. That area is overdue for some TLC. Did anything go not quite as planned on your wedding day? We had our ceremony outside and the reception inside… and about 10 minutes after we finished our outdoor pictures after the ceremony, it rained cats and dogs. Tons of rain. Thankfully, all the guests were inside and we barely escaped in time. I know it’s good luck for rain on your wedding day, but that was one thing I wasn’t planning on! What is your favorite summer smoothie recipe? Um…. whatever one I happen to order at the store. Ha! I’m pretty happy with any type of strawberry smoothie , nothing too fancy for me. What is the weather like where you are? I live in Florida and it’s July. Need I say more? It’s hotter than hot and every afternoon around four o’clock it rains. That’s summertime in Florida for you! What is your favorite book to read to your kids? These days, Molly is very interested in “Goodnight Moon” which is one of my favorites, so I always enjoy reading it to her. She’s very interested in reading Curious George books too, another of my favorites!